Our friendly and professional staffs will ensure that you are fully informed of your treatment plan, the process and the pricing before the commencement of your treatment. They are more than happy to answer any questions you may have. The practice has a clean and homely environment to better suit your comfort. It is fitted with high quality equipment with modern advanced technologies which are designed for greater patient safety and comfort. The practice is conveniently located on the corner of Greenwood Drive and Plenty Road, Bundoora. Onsite parking is available via Greenwood Drive or street parking is available in the service lane on Plenty Road. The practice is also accessible via Tram (Route 86, Bundoora RMIT) or Bus (Route 566, Lalor to Northland, via Greensborough). We are a family owned practice and our focus is providing high quality dental care for our local community. Having grown up and lived locally for many years we understand that you value high quality health care for you and your family. We also know that you are keen to improve your general health and well being and want to be provided with the right level of information to make important decisions about your health. 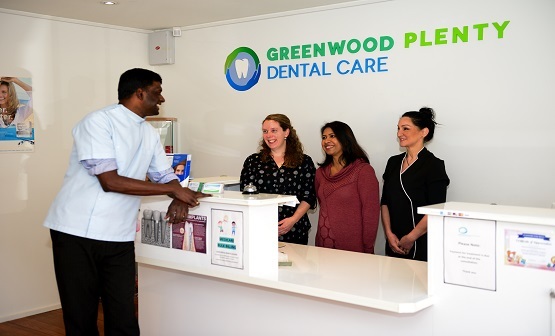 This is why at Greenwood Plenty Dental Care, we are dedicated to providing you with a safe and comfortable environment where professional, friendly staff are cable of providing quality dental treatment and provide you with sufficient information regarding your treatment. Patient safety and comfort – We will not compromise on patient safety or comfort. We will continue to invest in advanced modern technologies to improve efficiencies and treatment procedures. We will not take short-cuts on infection control and ensure that we comply with all sterilisation requirements for our instruments and equipment. Respect – We will provide sufficient and clear information on treatment plans, procedures and pricing to enable informed decisions by our patients. Integrity – We will provide our services with honesty and integrity. Professionalism – We will provide sufficient and clear information on treatment plans, procedures and pricing to enable informed decisions by our patients. Family – We will continue to provide high quality service to families and seek to provide flexibility with appointments where possible. Dr Tharma Balasundaram Dr Tharma grew up in Sri Lanka where he graduated in 2002 at the prestigious University of Peradeniya with a degree in Bachelor of Dental Sciences with honours. He worked in various practices and owned his own practice in Colombo for 3 years. In 2005, he completed his Australian dental qualification after fulfilled the requirements of Australian Dental Council exams. He then moved to practice in Wonthaggi, Victoria where he still continues provide services to his patients there. He also has experience working in Berwick, Bundoora and Mill Park. He has keen interest in all aspect of dentistry. He loves meeting new people and helping them improve their oral health to obtain confident smiles. He loves spending time with his family and friends. He also enjoys playing tennis, badminton, bowling, cricket and following his beloved Bombers.